The story of the “Old Leatherman” is very complex and burdened with a unique mix of fable, myth and reality. 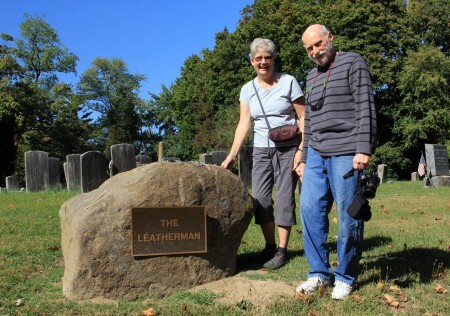 For this post I have decided to limit my dialogue to some basic details of Old Leather’s 30 years of walking his planned route through Connecticut and New York State. I have also included photographs of the Leatherman, one of his shelters (that is only 10 miles from my house), and his final resting place in Sparta Cemetery in New York State. 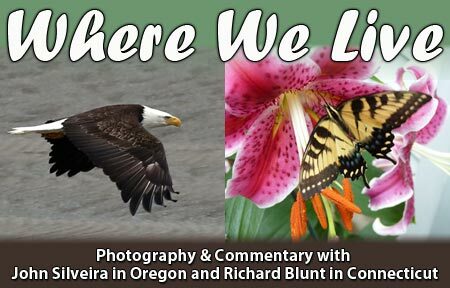 To help with some of the questions you may have after reading my comments and viewing the photos, I have included a link to an entertaining and informative You Tube video that was aired on Connecticut Public Television several years ago. This little rhyme became a popular jingle during the 1870s when a mysterious, forlorn man dressed all in leather clothing, of his own making, became a common sight wandering the country roads and railroad tracks of Connecticut and New York State. His curious garments were made of soft-tanned leather cut from discarded boot tops, and stitched together with leather lacing. A domed cap with a leather visor and leather shoes fitted with hand carved, wooden soles completed his unique outfit. Some have pinpointed his first appearance in Connecticut to be around 1856 in Harwinton; a town west of Hartford. He had a passion for silence, so his real identity has remained a mystery. Folks simply identified him as “The Old Leatherman”. He died in 1889, but his legend is still very much alive throughout New England, New York State and parts of Canada. From the day of his first appearance in 1856, he traveled between the Connecticut and Hudson Rivers, and possibly made trips to the Berkshires in western Massachusetts and as far north as Canada in his early years. In 1883 he began walking a regular 360-mile circuit. He entered Connecticut from New York near Danbury walking east to southeast, eventually turning south to the Shoreline and west to New Haven. He completed this 360-mile journey in about 34 days. The Leatherman was reported to be very regular in these trips. A record of his trips past a railroad station in Milford, Connecticut was kept for 6 years, from 1883 to 1889. In 1884/1885 he made nineteen consecutive trips, passing this point every 34 days. In March of 1888 a monster blizzard dumped 50 inches of snow in parts of Massachusetts and Connecticut, leaving snow drifts as high as 50 feet in places. The storm paralyzed the East Coast from Chesapeake Bay to Maine, bringing most types of transportation to a halt for days. However, the storm’s most noticeable effect on the Leatherman was to increase his 34 day circuit to 39 days. Old Leather was a tough man. He knew how take care of himself by employing an incredible ability to adapt to his ever-changing environment. But the “Blizzard,” along with a quickly-spreading cancerous growth on his lower lip, really took a toll on him. 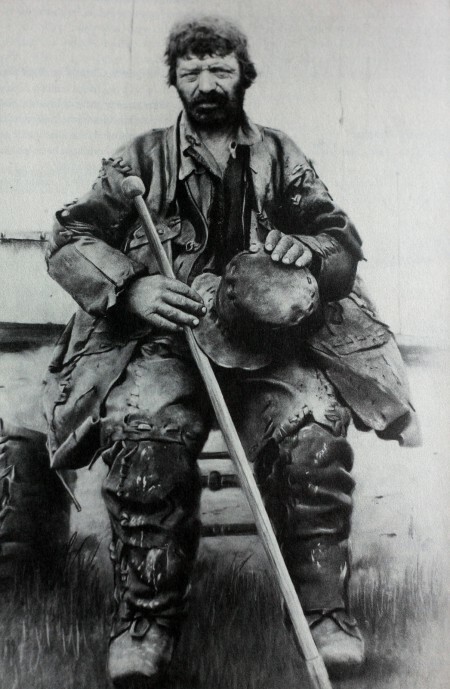 On March 24, 1889, he was found dead in one of his cave/rock shelters in Mount Pleasant, New York. 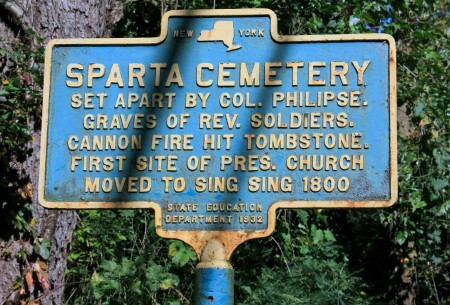 He was buried in an unmarked grave in Sparta Cemetery, located in Ossining, New York. The Leatherman, photographed on June 9, 1885. 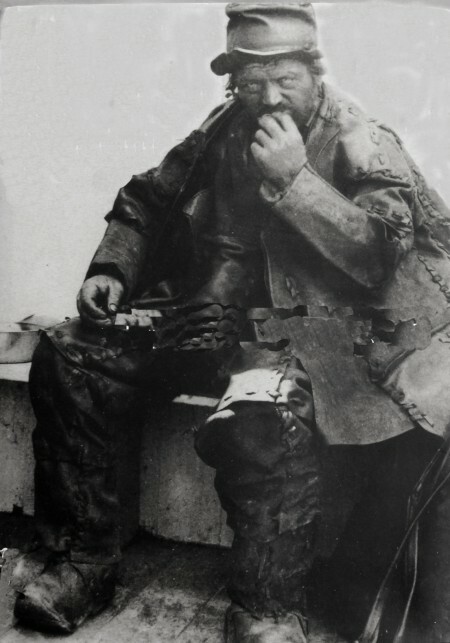 The Leatherman, photographed in 1888. This photo was used as the basis for the near life-size portrait, painted by A. V. Durant in 1892. 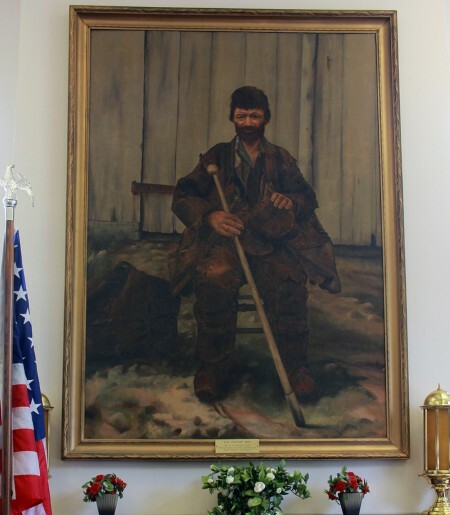 Durant’s portrait now hangs in the Derby Public Library in Derby, Connecticut. Thanks to the cooperation of the library director, Cathy Williams, and her staff I was able set up my equipment and take this photograph. Old Leather established shelters all along his travel route; some were cave/rock (slabs of overhanging rock), others were simple lean-tos made from fallen trees, branches and twigs. He was never known to eat, rest, or sleep under a man-made roof. 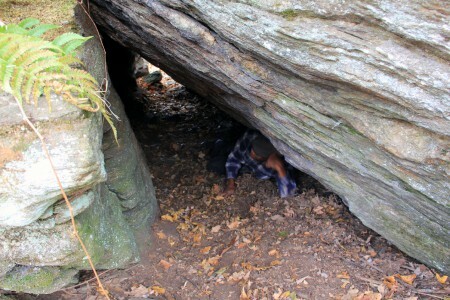 Tory Den is one of his cave/rock shelters that is a short distance from my home. 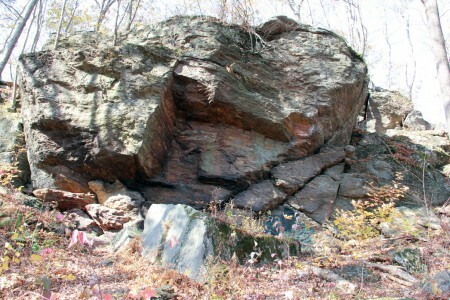 It was discovered by the grandson of Steven Graves on Thanksgiving Day, 1838. 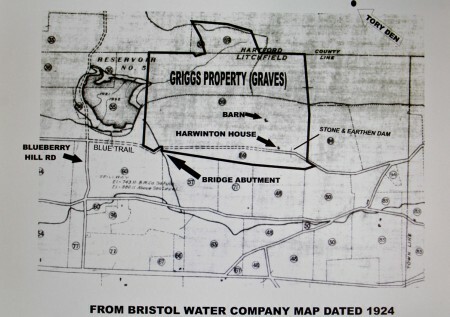 Graves was a Harwinton, Connecticut resident and the owner of property where the Den is located. Graves was also a Loyalist or Tory. Tories were the folks that remained loyal to the British Crown during the American Revolution. In 1778 Graves built a log cabin on this property. The cabin became a meeting place for Tory leaders from the surrounding area. After the war he built a spacious house on this site. It would later come to be known as Harwinton House. 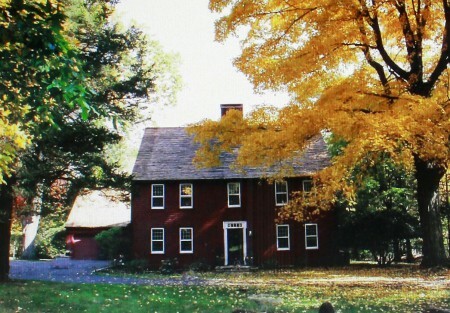 In 1931 the house was moved to New Canaan, Connecticut, where it remains today. In this part of Connecticut, Tories were relentlessly hunted by a group of Patriots called the Sons of Liberty. Any Tory captured by this group would face punishment, ranging from a severe beating to being hung. Whenever the Sons of Liberty were spotted in the area, a horn (conch shell) would echo through the trees, and Tories in the area would head for the Den to hide in safety. The Sons of Liberty relentlessly searched the area throughout the War, but failed to find the Den. 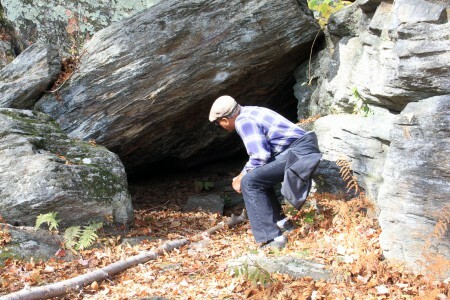 There is no verifiable information that indicates how the Leatherman discovered this and other cave/rock shelters scattered along his circuit. It is my feeling that he had extensive knowledge of Native American lore and was familiar with the entire area that he traveled. I also believe that he knew where he was at all times, and planned his route with precision. All of his shelters provided for him what he needed to stay alive: food, water, and protection from the elements. Most of the trees that blanket much of Connecticut today were not there during the Leatherman’s time. Early settlers cleared most forests to make room for farming. 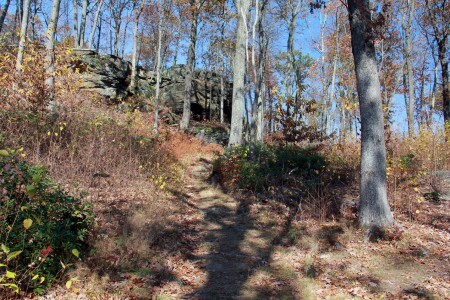 If you were new to the area today, locating the Den would be more difficult than it was for the Leatherman, because its location is masked by thick tree growth. A map showing the location of Tory Den in relation to Harwinton House. Armed with the map, shown above, my trusty compass and a pedometer, I set out on the Blue Dot trail to find the original site of Harwinton House and the Tory Den. 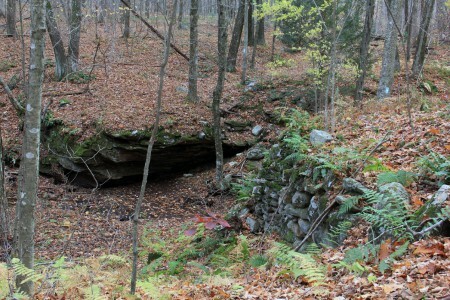 The Den is located on the border of Burlington and Harwinton in a rocky section of forest called the Mile of Ledges. 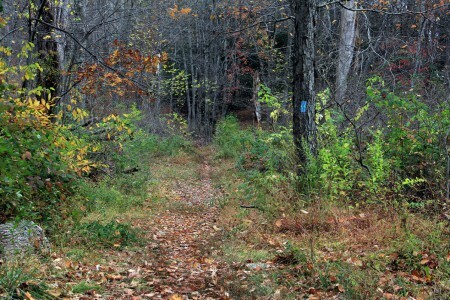 Following the section of trail, shown below, for about a mile into the woods led me to the Den. However, my attempt to follow the trail southeast to Harwinton House led me along what I figure is the most treacherous part of the trail. 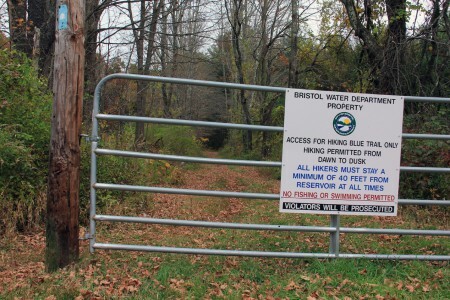 So I abandoned the effort and drove around Bristol Water Department property and entered the woods from another entrance to the Blue Dot. This section of the trail looked less hazardous. This is the south entrance to the Den. It was a warm sunny morning, so I spent a couple of hours exploring the area. The south entrance is high enough for me to enter by stooping only a little. It is also wide enough to accommodate several people, my size, sitting on both sides. The dirt floor was clean and free of the usual junk that accumulates in historic sites like this. This is a real tribute to hikers of the Blue Dot Trail. My maps indicated that I could get to the original Harwinton House site entering the trail from a different location. This part of the trail led me to a collapsed bridge abutment that I am sure was originally built as a crossing for horse-drawn carriages. In order to get across, I would have to make my way down a steep 20-foot rocky embankment and then up a similar bank on the other side. Carrying a heavy and expensive camera and tripod, this was more of a risk than I was willing to take. I can repair a broken arm, leg, or rib with less effort and expense than it would take to replace my equipment. So I turned back vowing to resume the search another day. When I return, I will post photos of the site. 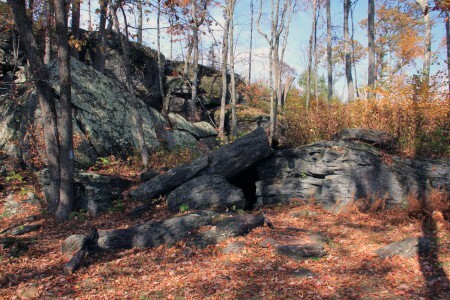 Large rock formations like these are common in the Ledges. 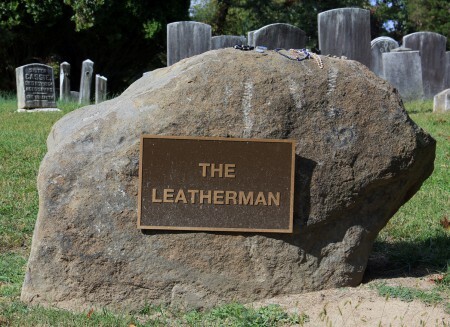 To spite of his popularity, the Leatherman was buried in a grave marked only by an iron pipe driven into the ground. Finally, in 1953, a grave stone inscribed with the fictitious name “Jules Bourglay” was placed on the grave. On May 23, 2011 his remains were exhumed with the hope of subjecting them to DNA testing. All that was found was a few coffin nails in the dirt. I think that Old Leather’s wish to remain anonymous has been realized. On May 27, 2011, whatever was unearthed from his original grave was reburied in a new grave inside the cemetery and memorialized by a new grave marker. Take note of the gifts on the grave marker, left by his still loyal adherers. Meet the Kelley’s from Alaska. Mr. Kelley grew up in Ossining, and as a kid made frequent visits to the cemetery to see and show his friends a grave stone that was damaged by cannon fire during the Revolutionary War. Unfortunately, the grave stone was no longer there. There was, however, a brief description of the incident inscribed on a plaque outside of the cemetery. Click on the link below, sit back and enjoy a video that is informative and loaded with interesting Old Leatherman information. This entry was posted on Friday, November 1st, 2013 at 6:00 pm	and is filed under New England Legends. You can follow any responses to this entry through the RSS 2.0 feed. Both comments and pings are currently closed. It was pure chance that our paths crossed at the Sparta Cemetery last month. Your work on regional history and the travels of The Leatherman were so interesting to us. Many thanks for taking the time to talk with us. What a lovely memory for us of our trip to Ossining. We value your work in bringing these stories of the past to those of us living today. Good travels.